Carabiners used to support a tree climber must be “self-closing and self-double-locking”, which means that they must require 3 distinct motions to open the gate and that the carabiner will auto-close and auto-lock when the gate is released. These three motions usually consist of pushing the carabiner sleeve up or down, twisting the sleeve, and finally, pulling the gate inward. Some carabiners replace the first step with the pressing of a button. Life support carabiners must also have a breaking strength of at least 5,000 lb. WesSpur stocks a wide variety of carabiners that meet his standard for you to choose from. For more on safety guidelines for tree climbing and tree work, check out the ANSI Z133 Safety Standard for Arboricultural Operations. All carabiners on this page are self-closing and self-double-locking. SwivaEye is a compact Double-Locking carabiner on a swivel eye to eliminate twisting lines. Perfect for your connection to your climbing line. Made in the U.S.A. The H-frame construction allows for a strong, locking carabiner in a compact size and low weight. This is a new contender for the most compact auto-locking carabiner out there! Perfect for streamlined climbing setups. Rated at 5,170 lb. (20 kN). Petzl BM'D H-Frame Carabiner with Triact Gate ANSI (M032 TL) New in 2019! The Bm'D is a lightweight, asymetrical, aluminum carabiner wtih reinforced gate sleeve for greater front and lateral gate strength. This reinforced Tri-Act locking ate allows this carabiner to meet the ANSI Z359.12. Bm'D may be used with a CAPTIV positioning bar to favor loading of the carabiner along the major axis, to limit the risk of it flipping. Rated at 32 kN. The popular Petzl Am'D carabiner has been redesigned with h-frame bar stock for a better strength to weight ratio and improved gate action and clearance. Rated at 6,070 lb. (27 kN). This unique Pin-Lock gate closes and locks like a double-locking gate, but a pin (included) is needed to depress a button so the gate can open. This makes the Pin-Lock Am'D ideal for adventure parks, climbing with kids, or other situations where the user should not open the gate. The popular Petzl Am'D carabiner has been redesigned with h-frame bar stock for a better strength to weight ratio and improved gate action and clearance. Rated at 6,070 lb. (27 kN). The popular Petzl William carabiner has been redesigned with h-frame bar stock for a better strength to weight ratio and improved gate action and clearance. Rated at 6,070 lb. (27 kN). The popular Petzl OK carabiner has been redesigned with h-frame bar stock for a better strength to weight ratio and improved gate action and clearance. Oval carabiners are excellent for Hitch Climber setups, as they keep your system well-aligned. Rated at 5,620 lb. (25 kN). Double-locking carabiner incorporates a high-efficiency pulley - ideal for redirects or haul systems. With locking Tri-Act gate. Petzl follows up the Rollclip with the Rollclip Z, which puts the carabiner opening on the end away from the pulley to make installation easier. This carabiner maintains 15 kN (3375 lb.) strength in all directions and has a 22 kN (4950 lb.) strength along it's main axis. Used to close any harness having two attachment points that must be joined with a connector. Designed to be loaded on its three axes. Key lock System (snag-free body/gate interface). Omni carabiner with screw lock gate is also available. High-strength, steel carabiner with TriAct gate. Rated at 9,000 lb. (40 kN). Symmetrical steel carabiner with Tri-Act gate and improved, H-frame design. Rated at 8,542 lb. (38 kN). The Durolock (Dual Rotor Lock) was designed to minimise the chances of accidental gate opening, and maximise levels of security. Its complex, yet easy to manipulate gate requires four distinct actions to open, and once released auto locks back to safe. It is perfect for complex/busy rigging applications. HMS steel carabiner is high-strength and zinc-plated to resist rust & corrosion..
ISC Offset Oval Carabiner New in 2019! ISC's offset oval combines the specification of an Oval with that of a 'D' shape Karabine, to combine higher strength of 'D' shape with utility of the oval shpae. The thin spine on this carabiner allows rotation of the Karabiner. This compact carabiner is 20% smaller than most other double-lockers, making it perfect for a compact climbing system. Available with the Supersafe double-action gate or Quadlock gate. The Quadlock is extremely secure, and once you get used to the action, opens easily, with one extra step adding an additional level of security against accidental opening. Asymmetrical D carabiner with 30kN breaking strength. Climb with confidence. This lightweight aluminum swivel snap from ISC makes the popular locking snap even more versatile. Triple-action gate fits climbing comp rules that require three separate actions to open. Simple and easy to use, this snap is a great choice for fliplines and lanyards. Innovative features reduce the chance of accidental opening and prevent rope snagging. Smooth swivel eye eliminates twisting and tangling of your line. Popular, lite alloy steel Double-Locking carabiner. Stainless steel gate and sleeve. Opens easily with downward pull on the gate. Made in the U.S.A. 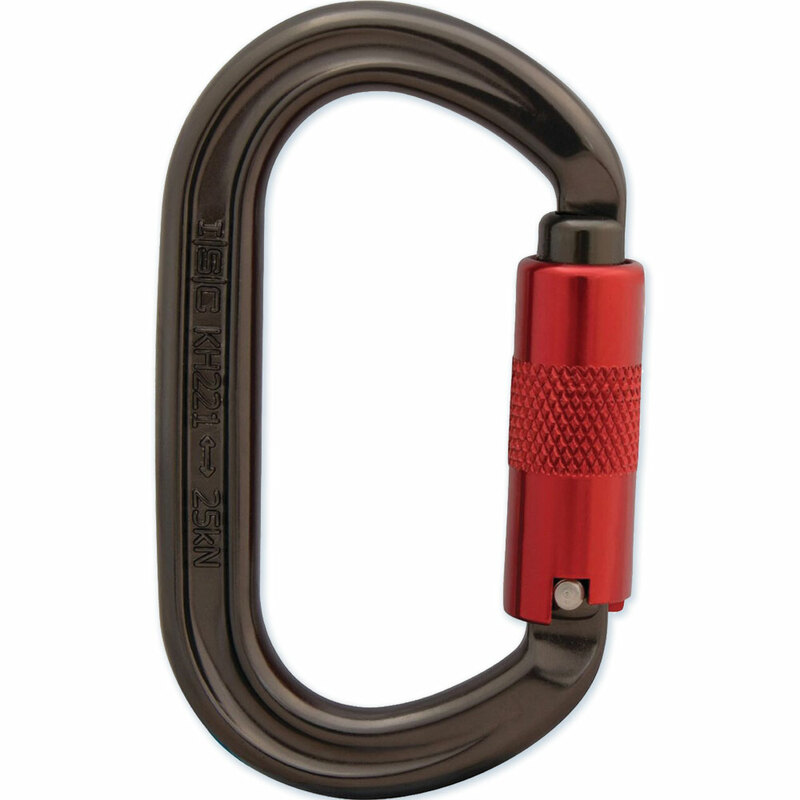 This carabiner features an ANSI Z359.1 compliant gate break strength of 16kN to meet all your OSHA compliance issues. Made in the U.S.A. 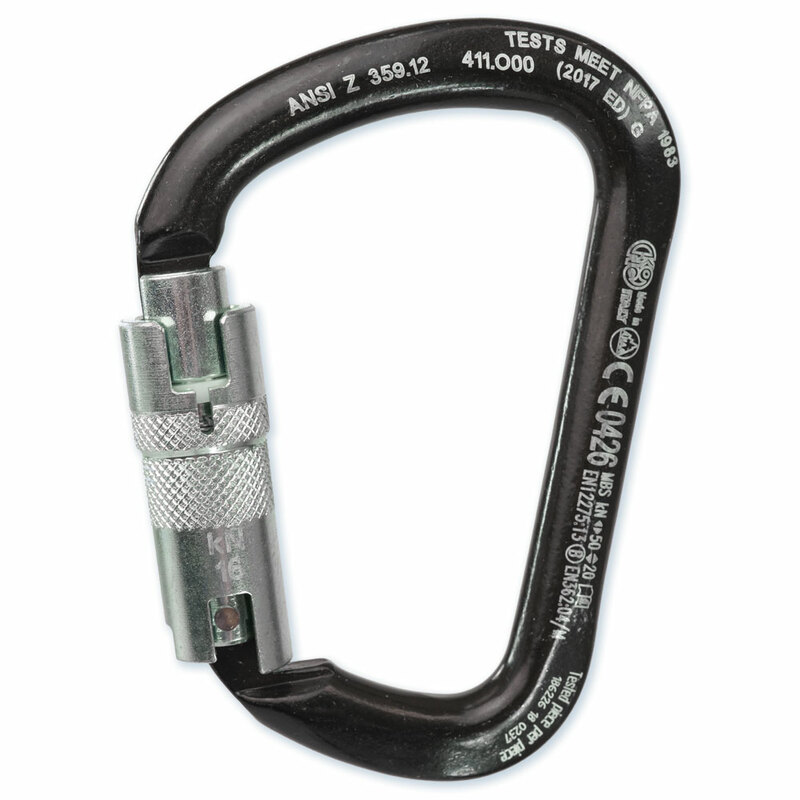 This lightweight carabiner from SMC is the first carabiner to meet both NFPA G-1983, and ANSI Z359.1 requirements. The Crossover also meets the Z133 guidelines for tree work. This is the ultimate carabiner for work at heights, with high strength at all angles, while still being lightweight aluminum. A large gate opening, precision crafting, and individual testing makes this a great carabiner. SMC assures that all carabiners are 100% visually and physically inspected. Made in the U.S.A. This popular item is compact and high-strength at a great price. 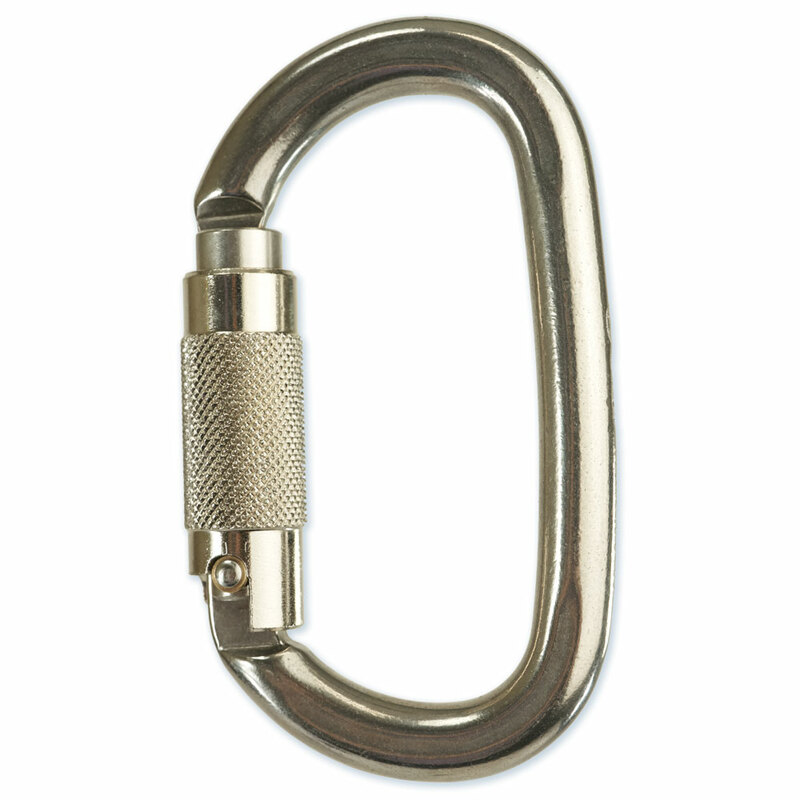 Oval steel carabiner from Climbing Technology. This high strength, carbon steel carabiner is a symmetrical oval shape for optimal loading, wide gate, and catch-free gate opening. Triple locking aluminum carabiner with a metal sleeve gate. Wide opening for easy attachment onto D rings. 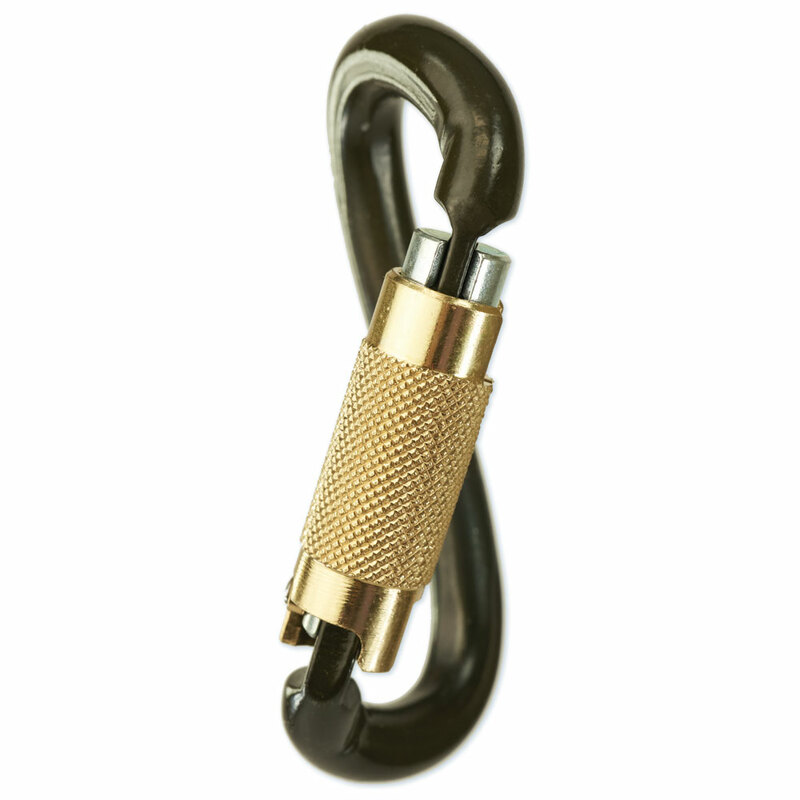 Captive eye carabiner has a metal gate and a captive eye large enough to accept 1/2” rope. This pear shaped carabiner features a groove in the top inside corner of the carabiner to make sure hardware is positioned correctly every time. Features a groove to keep rope properly aligned and a swivel for easy positioning while in use.